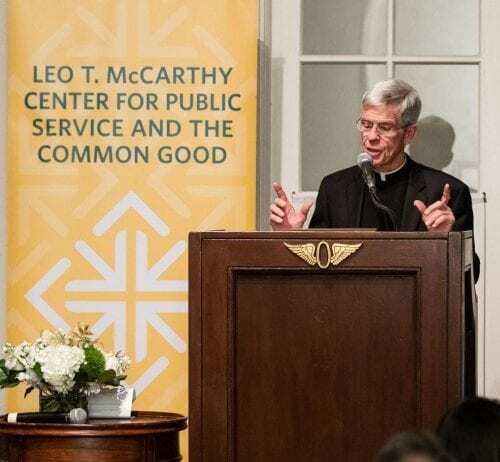 McCarthy Award recipient and USF President Emeritus, Reverend Stephen Privett, recently accepted his award, emphasizing in his speech, the continuous responsibilty of effecting justice in society. As I look at all of you, I realize that Leo McCarthy still gathers people together for a worthy cause. The McCarthy family, the staff at the Center, and I are deeply appreciative of your presence here tonight to support USF’s Leo T. McCarthy Center for Public Service and the Common Good. On this occasion, I am reminded of an axiom frequently cited by President Obama: the arc of history is long but it bends towards justice. This sentence could easily be misinterpreted to mean that justice is inevitable. This sentence is not an endorsement of some sort of historical determinism. We have no guarantee that things will get better—at least not in this world. Nothing bends towards justice unless we bend it. The Emancipation Proclamation did not end slavery; women’s place in society was not secured with universal suffrage; segregation continues after the Supreme Court decision; President Johnson’s war did not end poverty; the Affordable Care Act did not deliver quality health care to every American. These victories were real but not definitive. We are responsible for bending the arc and that responsibility never ends. I am honored to accept an award named for Leo T. McCarthy, whose lifelong efforts on behalf of farm workers, children, working mothers and other vulnerable populations bent the arc of history towards justice to an extraordinary degree and inspires us still. It is humbling to receive an award previously given to Mayor Art Agnos whose courageous decision to stand with the homeless of San Francisco bent the arc of history toward justice. I am especially honored to receive this award from Speaker Nancy Pelosi who daily “renders unto God” by “rendering unto Caesar” and keeps bending the arc of history towards justice. I was privileged to work alongside Art Agnos, Nancy Pelosi, and Sharon McCarthy Allen with Leo as he designed and developed the Center bearing his name. More than once, I heard Leo remind USF students that knowledge is not just something they carry around in their heads; it is what allows them to advance the concerns and issues of the impoverished and marginalized. No one better exemplified that most Jesuit understanding of education than Leo McCarthy himself. Leo wanted his Center to fire the idealism of students, channel their energy and equip them intellectually to fashion a more humane and just world, no matter their profession. That same understanding of education drives the McCarthy Center and Verbum Dei High School in the Watts community of Los Angeles. Verbum Dei prepares young men–exclusively African American and Latino–from underserved communities for college and for lives dedicated to bending the arc of history toward justice; to rewriting the national narrative from one of narrow intolerance and heartless indifference to one of generous inclusion and compassionate outreach. Verbum Dei students and USF students –particularly those who participate in McCarthy Center programs– are a pledge and a promise that bending history’s arc towards justice will continue long after many of us have stepped off of history’s stage. To support the McCarthy Center and Verbum Dei is to help bend the arc of history towards justice. This entry was posted in Uncategorized and tagged verbum dei, vernum dei high school. Bookmark the permalink.